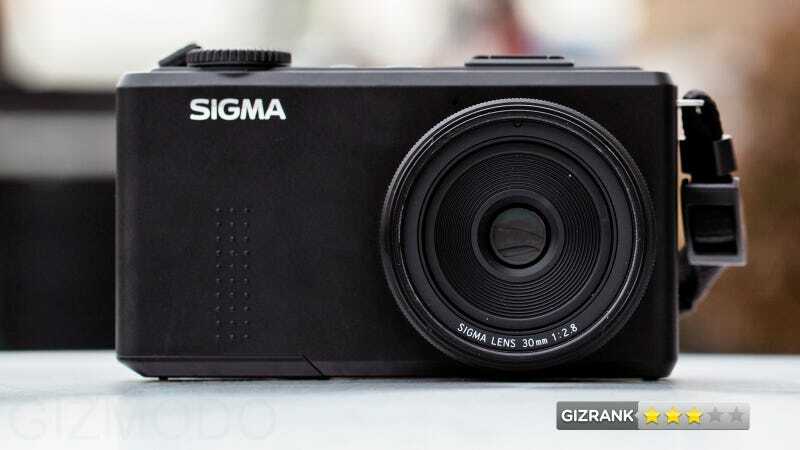 Sigma is better known for its camera lenses than its cameras. But the company also makes a ridiculously strong imaging technology—the semi-legendary Foveon X3 image sensor. The Sigma DP2 Merrill is Sigma's latest attempt to mobilize this sensor in a camera. Can it crush? A compact $1000 camera with a 23.5 × 15.7mm Foveon X3 image sensor and a 30mm fixed lens. Fussy photographers who sweat the details of their images. A big, black, rectangular block with a lens hanging off. The on-body controls are minimal. The Sigma DP2 Merrill is best used in semi-automatic modes, like aperture priority, with the autofocus turned on. It's designed to be used in fully-manual modes, but the LCD's crap quality makes a guessing game out of manually focusing and fully controlling exposure. Unloading a day's worth of photographs onto your computer, only to realize that they're beautiful. This camera's guts are impeccably designed. Its body—the weak LCD, the limited controls, the generally unpolished construction—will almost certainly get in your way. The three-inch LCD looks terrible in spite of a its high resolution—920,000 pixels! So what's so special about the camera's Foveon X3 image sensor? It's the same APS-C size as cheap DSLRs like the Canon T4i and sweet mirrorless cameras like Sony's NEX line. But the DP2 Merrill has 46-megapixels (sort of). It's really just three 15.4-megapixel layers stacked on top of each other—one layer of photodiodes for each of the primary colors. True to its design, the image sensor's color rendition is impeccable. Photos taken at ISO 800 or lower are noise free. This lens is sharp. On the other hand, the camera's image quality falls apart at high ISO. The camera's battery is only good for 50-60 photos, which is very low compared to basically every other camera on the market. The DP2 Merrill is compact and lightweight, but it won't fit in your pocket. Strolling around with it hanging from a neck, tourist-style, is quite enjoyable—it's ideally suited for street photography. This sensor is also available in the DP1 Merrill, a 50mm fixed lens version. Probably not. The DP2 and DP1 Merrill are Sigma's second try at building a compact vehicle for a Foveon X3 sensor, and this camera still feels very much like a concept. The imaging technology is incredible, but the box it's inside of isn't quite there yet. For this price, that's a big compromise. This camera will make some pixel-peeping nerds very happy, but most people will probably be frustrated with its usability. That said, if Sigma keeps improving this concept, we've got a lot to look forward to in the future.